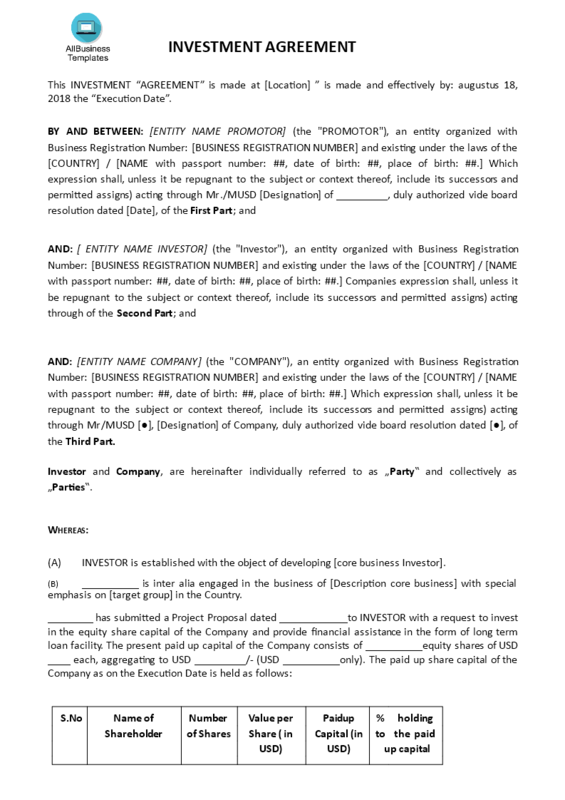 How to draft a professional Company Investment Agreement between investor, company, and promoter? Download this investment agreement template that will perfectly suit your needs! In order to receive an investment, it's essential for individuals and companies to ensure truthful, accurate information exchange to be able to do morally-correct decision making. This is done by creating an Investment Agreement between the parties. When large amounts are at stake, communication might involve legal complications, and therefore this requests extra attention. Using this easy-to-modify Company Investment Agreement helps to make a solid document for any kind of investment. Download this professional agreement now and save yourself time, efforts and possibly reduce the lawyer-fees in order to become more successful. By using this template you will see you have a comprehensive document in hands to deal with this situation. However, it's not a legal advice, and, we still recommend you to consider to find legal support in case you have doubts about dealing with it the right way. This Startup Starter Kit is a compilation of the most important business, legal and marketing documents to help early-stage startups with all things that are crucial and important!